It is said that Mercedes-Benz design chief Bruno Sacco told his staff to "forget everything you have learned so far" when unveiling details of the A-class concept to his advanced Design Team. 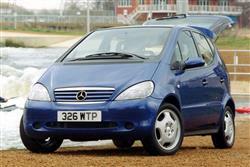 Certainly, the final result of their efforts was like no other Mercedes. The company's first-ever entry in the growing supermini sector is part-mini MPV, part-family hatchback and part-supermini. Yet, despite its diminutive dimensions, it offers interior room comparable with a C-class. 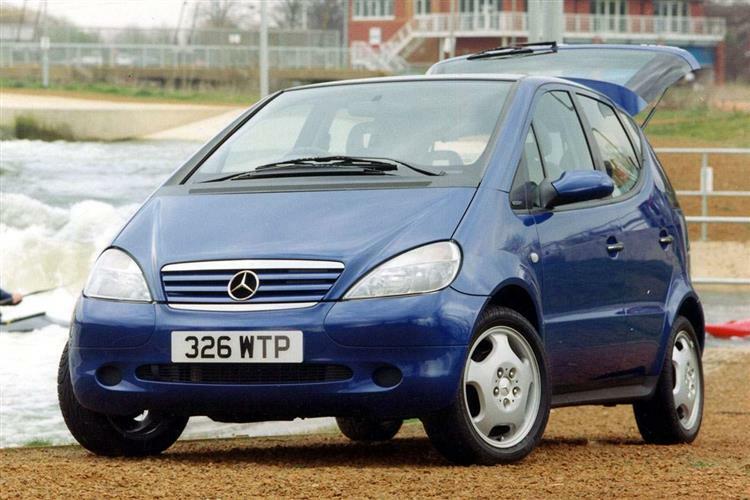 Mercedes' first attempt at a front-drive car displays considerable ingenuity. The whole length is one single passenger compartment with the mechanicals lying underneath below a unique 'sandwich' floor design. In a crash, the engine is designed to slide underneath the floor, instead of into the cabin. Passengers are also out of range in many side-impact accidents because they're sitting higher than usual. That also makes the car easier to enter and exit. Models Covered: A140, A160, A170CDI, A160CDI [Classic, Classic SE, Avantgarde, Elegance]; A190 [Avantgarde, Elegance] A210 [Evolution]. The A-class had a delayed start in Britain, due to a last-minute revision of the suspension and the addition of a number of safety features. Adverse publicity about the car's in extremis handling during a manoeuvre peculiar to Scandinavian countries led to a delay of several months while modifications were made. 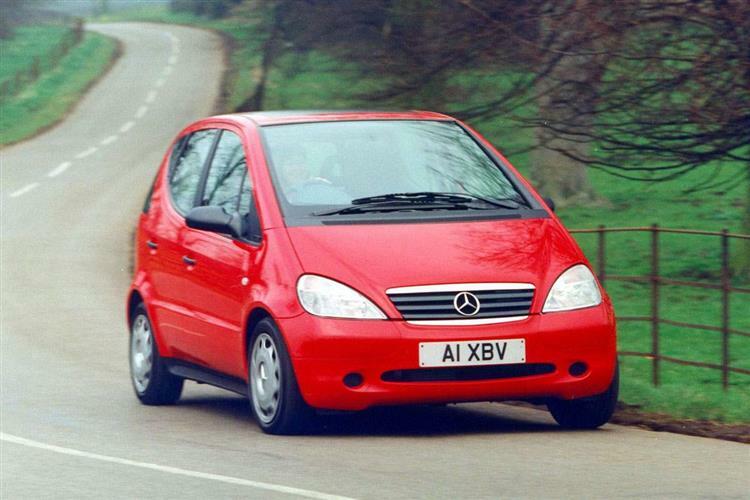 That meant that Mercedes' new baby arrived in Britain in September 1998 with meatier tyres, revised suspension settings, the wheels set further apart and a lower ride height to improve stability. The price had risen £1,000 above initial expectations but the car was extremely well equipped with sophisticated technology for avoiding accidents. For example, it now had ESP (a sophisticated Electronic Stability Programme) as standard; this was originally intended as an expensive option. Here, the standard anti-lock brakes automatically slow the car when sensors detect the possibility of a front or rear skid. Mercedes had also added a traction control system (ASR) to ensure the power actually reached the road when accelerating out of dangerous situations. Plus there was 'Brake Assist' to optimise emergency braking and no fewer than six front and side airbags. This was arguably the safest supermini-sized car on offer at the time. The initial range featured three engines. There were 1.4-litre and 1.6-litre petrol units and a 1.7-litre direct-injection diesel with the latest 'common rail' technology. Three trim levels were on offer - base Classic, sporty Avantgarde and luxury Elegance. The initial transmission choice was either a conventional five-speed gearbox or a clutchless manual and many cars have this option, which Mercedes calls the 'Automatic Clutch System'. Automatic transmission was listed as an option for all models from launch but deliveries did not commence until mid-1999. A larger 1.9-litre petrol engine became available in May 1999 but this was only offered with Avantgarde or Elegance specification. At the same time, Mercedes upgraded interior trim across the range, redesigned the front seats and added extra equipment such as a front centre armrest in Elegance models. In 2001 the range was facelifted slightly, the key visual change being the addition of neat bumpers, and the A170CDi engine received a slight boost in power. Early 2003 saw another fettling of the line-up. A 75bhp A160CDI diesel was added and door mirrors with integrated indicators were also introduced. Trim levels were also tweaked with an air-conditioned Classic SE version slotted into the range. The Avantgarde model also got air con in place of the rather unpopular louvred sunroof. Production of the A190 and A210 Evolution models ended in early 2004 and in the early part of 2005 an all-new sharper-looking A-Class arrived to replace the old model range in its entirety. Equipment levels are quite high for a supermini-sized car though you'd expect a good deal for the price. As well as all the safety equipment mentioned earlier, every A-class has power steering, tinted glass, central locking, all-round electric windows and a six-speaker stereo system as standard. Opt for an Elegance and you get alloy wheels, air conditioning (essential in summer with all that glass) and a higher standard of trim. The Avantgarde, on the other hand, has blue-tinted glass with a band-tinted windscreen, a slatted folding sunroof (later swapped for air conditioning), ivory-coloured dials and alloy wheels. Bear in mind that there is a vast options list, so it is quite likely that no two cars you consider will be exactly alike. You'll find, for example, that some early Avantgardes have optional air conditioning in place of the sunroof and that a wide variety of audio systems are fitted across the range. Leather upholstery, available in bright colours, is a popular Elegance option; the Avantgarde has grey half-leather trim. (approx. Based on A160 model) Allow around £40 for a set of front brake pads and £25 for the rear and about £175 (excluding catalyst) for a factory exhaust system. A full clutch replacement would cost around £175, a radiator is about £135 whilst a starter motor can be up to £250. A new alternator would be in the region of £445 and a front headlamp would cost about £95. The handling won't excite the enthusiastic driver but there's nothing wrong with the performance. Of the two smaller petrol engines, the A160 is the more relaxing to drive while the 1.9 majors on low-down pulling power so you need to change gear less around town and it feels less frantic on the motorway. The clutchless manual takes a little getting used to but is very smooth once mastered. Ingenious, spacious and well-equipped, the A-class is no less a Mercedes, despite its compact size. It's not cheap but it should hold its value as well as its bigger brothers.